In 2013, Alan sent an email that would change the course of his life. A life that, at the time, felt unhinged. A year prior, in 2012, Alan had returned from his second tour in Iraq, he was a father, and his marriage was falling apart. He was suffering from PTSD and depression, and the life he knew was quickly coming to an end. He retired in 2013 from the Army, on the heels of his divorce. He was living off his Army benefits and working as a fly fishing guide, a hobby which had quickly become a focal point in his life. During that time, Alan didn’t have a place of his own, and was bouncing around from place to place. He didn’t have much money or direction for his life. In the wake of his divorce, and after finally having enough money to get an apartment of his own, he sent an email to his father putting the idea of tiny home living on the table. During the time between pitching the idea, and the start of the build in 2016, Alan was faced with insurmountable pressures. He received a notice in the mail that the rent on his one bedroom apartment would be going up, an expense that was far past what he could afford. He shuddered at the idea of having a roommate and hated the fact that his daughter couldn’t have a space of her own when she came to stay. During his two tours in Iraq, Alan only had a private space of his own for two months. During those two months, his private space consisted of a 5’x8’ plywood box with a fabric door. In comparison to the plywood box, a tiny home was a fully customizable mansion. Without knowing it, the tiny home would also be the thing that changed his life. His life had reached a tipping point when his parents moved out to Colorado in 2016. Alan desperately needed a lifestyle change. Finally, what started as a simple email to his father in 2013, turned into a tangible goal in 2016 when he purchased the trailer the tiny home would be built on. Alan immersed himself in the build of the tiny home and became enlivened by the project. His dedication and love for his home is built into every square foot. Alan has a love for things that others might throw away, and he has curated many vintage and used pieces for his tiny home. Things like a beautiful turquoise vintage oven, and a small vintage washing machine that doubles as his stainless steel kitchen sink. The floor of the tiny home is constructed of wood pallets, which are dented, grooved, mismatched and imperfect, but made beautiful with turquoise fill and a clear varnish cover. Alan calls this his ‘wood museum,’ and it’s a highlight of his home. The tiny home features two lofts, one is his sleeping space, and the other is his daughters, so she finally has space of her own. His bedroom is built so he can live into his old age in the tiny home, and features a half-stair, which means he can easily walk up and down into his loft, and stand fully upright when getting into bed. His tiny home is not just a quick fix solution to increasing rent prices in the city, but rather his long-term retirement plan. And with the low cost of his “life-refi,” retirement from having to work might not be that far off. The cost of Alan’s home, land and car is enough to make anyone long for tiny home living. The loan for his land, Jeep, and building his tiny home only costs him $500 per month. A monthly mortgage that is unimaginable in today’s market. But Alan wants veterans to understand that giant houses and huge mortgages are not the key to a fulfilled life. Alan chose his lifestyle first and then built his tiny home to suit how he wants to live his life. He didn’t buy into the idea that in order to have a successful, fulfilled life, you have to purchase a giant house. 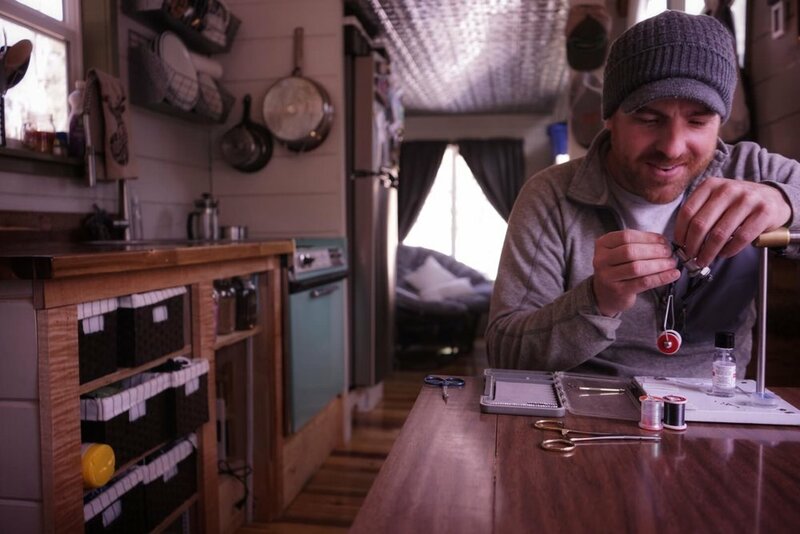 He loves to fly fish and spend quality time with his daughter, and his tiny home reflects that. Because his home costs so little per month, he doesn’t have to work as hard to make ends meet, which means he can spend more time doing what he loves and be more available to his daughter. This concept is what attracts people to tiny homes in the first place, and what makes this such a great option for Veterans. Buying a traditional home often times means taking out a huge mortgage to cover the cost. This puts significant pressure on buyers, who then have to secure income for upwards of 30+ years in order to make payments. It’s a rat race that's enough to make a civilian shudder. For veterans retiring from service, who may or may not have retirement benefits or skills to find a new career, it’s an incredibly daunting situation. Many veterans find it incredibly difficult to find work after retirement from the military, for reasons that include lack of skills translation, acclimation into corporate culture and negative stereotypes, among others. Unemployment rates for veterans vary, but post 9/11 veterans have struggled the most, with unemployment rates far exceeding that of non-veterans, with rates for post 9/11 veterans that hit a staggering 12.1% in 2011. Pair this with steep costs to purchase homes, and it’s no wonder that 39,471 veterans are homeless, according to the U.S. Department of Housing and Urban Development. Is this how the men and women that have fought for and served our country should be living? The Tiny Home Objective is envisioning a different future for veterans. We want to not only teach veterans valuable trade skills, which they can use to find jobs, but also give them an affordable alternative to drowning in mortgage debt. Tiny homes take the unnecessary stress of home ownership off the shoulders of those who fought for the American Dream, the dream that thousands of Veterans never have the opportunity to achieve for themselves. We’re helping veterans envision a new kind of American Dream. One that is focused on living a life of your own design, on your terms, without financial burden and stress. Because the stress of fighting for your country is enough. This is the kind of future our veterans deserve. This is the kind of future the Tiny Home Objective is building for our veterans. The Tiny Home Objective is in the process of securing non-profit status and is taking donations so we can teach veterans how to build tiny houses, and in turn, develop valuable trade skills, and to award them with a tiny home of their own. If you would like to help change the lives of those who fought for our freedoms, you can make a charitable donation to our cause.